What's Uglier Than The Viral Carlsberg Video? The Reaction To The Viral Carlsberg Video. By now, many of you have probably viewed that viral video of a Carlsberg promoter getting berated as she was working, seemingly without provocation. My first reaction when watching it was fear. Fear that I could be going about my ordinary daily life, and somehow, through no fault of my own, draw such hate and vitriol upon myself. How the girl in the video handled herself is admirable. The behaviour of the man recording and berating her is inexcusable. But that doesn’t mean that the fallout after the video is justified. The early stages were alright. The man posted the video online expecting support for his actions. What he got was general derision. It could have ended there. But it didn’t. What came next was an escalation only possible in the era of social media, with photos of his daughter and family, information about his workplace, and details about his personal life being widely shared. He was wrong to do what he did, but the actions of the people who dug out those private details, shared them in retaliation, and made threats, are also wrong. How sincere was his apology? Was he apologising out of genuine contrition for what he had done, or was he apologising out of fear for his own safety, and for that of his family? Even his workplace was revealed, and its listing on Google was vandalised (the Google review feature for the company listing appears to have been deactivated, possibly due to the high volume of spammy 1-star comments after the video went viral). Some reports say that the man has lost his job since. There have even been comments made on social media and online forums that indicated they’d want to keep up the hounding of the man and any of his known affiliations, until he decides to kill himself. The first and easiest reaction of a rational person when faced by what that man has done is anger. However, that same anger when directed towards one target (like that man) becomes a mob mentality. That one man has a terrible and bad mindset, but the anger that is directed at only him is misplaced. He is the product of society. And for us to not have products of society like him anymore, society has to change. It is not the anger of a lynch mob against one man that will change and improve our community. Hatred will only increase a them versus us mentality. If there is anyone else who has a similar ideas to the man, what will they think of all that has gone down? They might feel fear. They might feel anger. But it is unlikely that they will see the group that persecutes someone they agree with in a positive light. What happens then? They avoid anyone who might treat them the way the man was treated. They isolate themselves. They find only others who agree with them. And more of them are fostered in that environment. The more they gather and share their ideas, the more entrenched and extreme they become. So it is up to the silent masses to help drive change not the mob; those who are open to this thought: Isn’t there a better way? We are a new Malaysia, or so we tell ourselves. But my final question up for consideration is this: is what that is being done to him any better than what he did? Imagine the possibilities if we had a positive reaction to his negativity instead. Rather than berate him in turn and “punish”, we put up solidarity in the face of his anger. Imagine individuals sharing personal stories about unity and harmony. Imagine corporations getting on board, pushing out their own messages of tolerance and liberality. Imagine a nation, when faced with anger and intolerance, that rises up to respond with love and kindness, and changes lives and minds by showing a good example with actions (as a hopeful note, there have been companies offering the man a “second chance”). 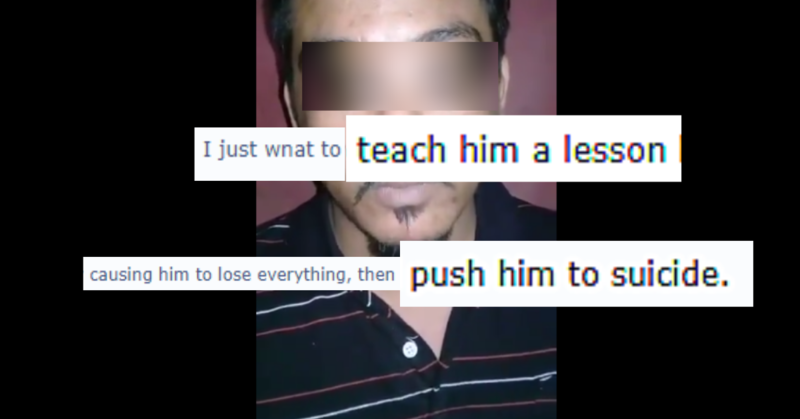 Imagine if his post had been met with thousands of reactions of positive unity, of thousands of examples of how he can do better, that would show him and others like him that we Malaysian see the wrongness of what he has done, we condemn it, and then we demonstrate what could and should be done instead. This could have transformed into a whole movement. Doesn’t that seem like a better new Malaysia? It is not the easier way. It is not a way that has an immediate action that leads to an immediate solution (hound the man! make him desperate! hope he kills himself!). But this is the way forward for a truly civilised society, where due process takes precedence over the anger of a mob. The man should face justice in its time, done properly through the court of law (police are reportedly investigating the case under Section 509 of the Penal Code for intentionally causing insult, which can carry up to five years’ imprisonment). He should not fall at the hands of angry citizens. If we want lasting change, we have to make the choice to do what is more difficult. A mob crushing down one man will not change society. Thousands of people seeing the wrongness of one man’s actions and choosing to do better will. The girl did not deserve to be treated the way the man treated her. And the man does not deserve to be treated the way he has been now. Writer’s Note: I made a deliberate choice not to include more details of the man involved, his name, or of his family, or even his workplace in this article. Those have been shared enough on the internet. The views expressed in this piece are the author’s own, and may not necessarily reflect the views of the publication. Feature Image Credit: Compiled from @fiqsunny on Twitter.